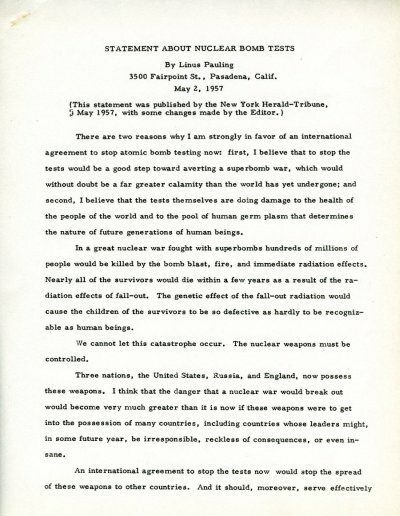 There are two reasons why I am strongly in favor of an international agreement to stop atomic bomb testing now: first, I believe that to stop the tests would be a good step toward averting a superbomb war, which would without doubt be a far greater calamity than the world has yet undergone; and second, I believe that the tests themselves are doing damage to the health of the people of the world and to the pool of human germ plasm that determines the nature of future generations of human beings. In a great nuclear war fought with superbombs hundreds of millions of people would be killed by the bomb blast, fire, and immediate radiation effects. Nearly all of the survivors would die within a few years as a result of the radiation effects of fall-out. The genetic effect of the fall-out radiation would cause the children of the survivors to be so defective as hardly to be recognizable as human beings. We cannot let this catastrophe occur. The nuclear weapons must be controlled. Three nations, the United States, Russia, and England, now possess these weapons. I think that the danger that a nuclear war would break out would become very much greater than it is now if these weapons were to get into the possession of many countries, including countries whose leaders might, in some future year, be irresponsible, reckless of consequences, or even insane. An international agreement to stop the tests now would stop the spread of these weapons to other countries. And it should, moreover, serve effectively as a first step toward a more general disarmament, with ultimate international control of these terrible weapons. A strong argument in favor of this first step is that inspection is simple. No large bomb can be detonated by any nation without detection. The second reason for halting the tests is that the tests do harm to the health of people all over the world and to the pool of germ plasm of the human race - those precious molecules of deoxyribosenucleic acid that carry on to our progeny the characteristic qualities that make us human beings. It is difficult to discover how great the damage is that is done by the fall-out radiation of the bomb tests. I have examined the available information, such as that in the report of the National Academy of Sciences, and have made my own estimates of the magnitudes of these biological effects. I think that nearly all scientists who have studied these questions would agree that my estimates are reasonable ones. Some statements about the magnitudes of the effects are misleading. For example, it may be said that the average amount of fall-out strontium-90 that gets in the bones of people all over the world is only one one-thousandth of the maximum permissible amount. This statement suggests that the fall-out strontium-90 would do no harm. But in fact the maximum permissible amount, which is an arbitrary standard set by health authorities, does harm. It has a large chance of causing bone cancer and similar diseases, and even one one-thousandth of this amount per person in the whole world could cause hundreds of thousands of people to die. When it is necessary, we may permit a few people, who work voluntarily in certain hazardous occupations, to receive radiation exposure that does them some harm. To expose the whole human race is another matter, a far more serious one. The radiation due to fall-out from the atomic bomb tests, including that from the strontium-90 that accumulates in the bones, is small in amount compared with that from cosmic rays and other natural sources. But the effects of the bomb-test radiation are not negligible. The National Academy of Sciences report emphasizes that even small amounts of radiation are harmful. I estimate that the bomb tests that have been made so far, amounting to about 50 megatons equivalent of fission, will ultimately have caused the deaths of about one million people in the world. These one million people will have died ten or twenty or thirty years earlier than their life span because the radiation has produced bone cancer, leukemia, or some other disease. I estimate also that these bomb tests will cause the birth of 200,000 seriously defective children in the next generation of human beings, children with serious mental deficiency or serious physical defects. If the British Christmas Island tests are carried out and one superbomb, with five megatons equivalent of fission, is exploded, I estimate that it will cause the deaths from cancer and other diseases of 100,000 people now in the world and will increase by 20,000 the number of seriously defective children born in the next generation. hese effects of the bomb-tests are small, in a relative sense. Hundreds of millions of people in each world generation of a thousand million people die of cancer and similar diseases, and an additional one million deaths would escape detection. In each generation there are born about twenty million seriously defective children, two per cent of all births, and an additional 200, 000 is only a small relative increase. But the dictates of humanity, of morality, require that we give consideration to individual human beings. In an absolute sense the effect of the bomb tests in causing the deaths of an estimated one million individual human beings and in causing 200,000 seriously defective children to be born in the next gener-ation and in each of a score of succeeding generations is no small matter, no negligible effect. It is instead, a crime, a crime against the human race. It is immoral, a violation of the principles of humanity. The biological effects of the bomb tests that have already been carried out cannot now be averted; they are inevitable. But if bomb tests amounting to another 50 megatons of fission, another ten great superbombs, are carried out during the next few years, the damage will be doubled; these tests would cause an additional one million deaths, an additional 200,000 defective children in each future generation. The bomb tests must be stopped. An effective international agreement to stop these tests, subscribed to by all nations, must be made. Enclosed please find the little missive that I just received from the Internal Revenue Service. I did as you said, filed a separate return, so that you could continue to claim me as an exemption, but they seem to feel that I owe them tax. Above is a letter that I have written them; I hope that you find it satisfactory. Needless to say I will be pretty mad if I only get a twenty two dollar refund rather than the fifty seven dollar refund that I expected. I only hope that you were saved more than thirty five dollars by claiming me, because I could have avoided this by filing a Joint return. Please hang onto the notice from them, as I ought to keep it, I suppose. I got a letter from Rosoff, the first one this year. It appears that he is going to be in Pasadena this summer, unfortunately. He claims to be able to get me employment for the summer, but I know how these things have gone before. Anyway, I am quite happy with the employment that I got for myself. Rosoff apparently has a snazzy new Ford, he has been begging his parents to let him buy one, or at least some sort of car, for years now. Apparently what he does is put everything he earns into a savings account, and then live completely off his parents, so he has quite a cache laid away. We were thinking that if you happened to plan to be at the ranch during the time we are driving south that we might be able to stop over for a day, because with her baby we won't have another chance to go during the summer, unless we go on the way north. We would probably be able to get there on the 5th of June, a Wednesday. Just an idea. Please let me know what you think about Dan Kemp coming with us - he is interested and I must confess that I have sort of committed myself. There are some interesting birds around now - they are sparrow sized, but largely grey, with a green back and neck, and a white space on their breast and a little on their wing, ventral surface. One family has built a nest in our house. The neighbors have five pups - mongrel, about six weeks old. They are lively little creatures, and cute as can be! We go out and play with them occasionally, and I confess yearn for our own, but our baby is going to be enough for a while. I mentioned this income tax business to a fellow at school, and he says that I do have to pay tax, even though I am a student, that the only thing a student means is that you can deduct for me. Oh well. I wrote Peter and Julia a couple of weeks ago, and just got a very nice letter from Peter. He says that Thomas is just about weaned by now, only getting a drop now and then for breakfast. I have been meaning to write them for a long time, and was very pleased to hear from him. Three weeks of classes! It is hard to believe, that in a month we will be on our way home. When I think of the work to be done in that time I am appalled, but I am optimistic enough to assume that somehow it will all get done. Dan Kemp took his junior quals this weekend, and we are going to have a very small celebration party for him this evening. We have made Tahitian rum punch-one bottle wine, one can frozen orange juice, one pint rum style, sharing the cost between everyone. It has been so long since we have been to a party that I do not feel too guilty. Well, it is supper time. I sent the letter to the income tax people anyway; it can do no harm. Locher sends his regards; he is a fine man. PS. That prospective freshman, Linda Logan, hasn't shown up as yet.